Each summer I always invest in a new pair of shorts. Last year they was super short and super distressed, this year I found the “boyfriend short”. Now, I am not the tallest of girls by any measure. Standing at 5’2″ I generally try to avoid boyfriend jeans like the plague because I feel like they just don’t look good on me, but these neon Jbrand’s were different. I can cuff them so that aren’t a awkward length, and they hug in all the right places, giving a little bit of room without being too baggy. I’m kinda obsessed. The color is also pretty fantastic!! 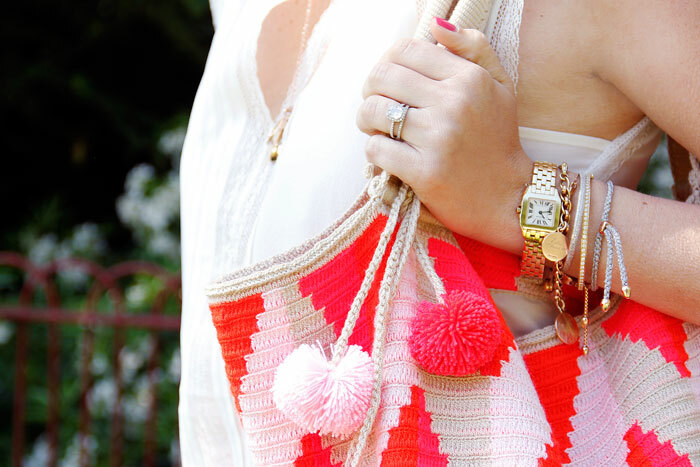 Another fun thing to jazz up your summer wardrobe is a great beach bag. Now, I say beach bag, but this crochet Sophie Anderson number is also perfect for just hanging out in the park in London or simply walking around town, I’ve even used mine as a small airplane carryon. 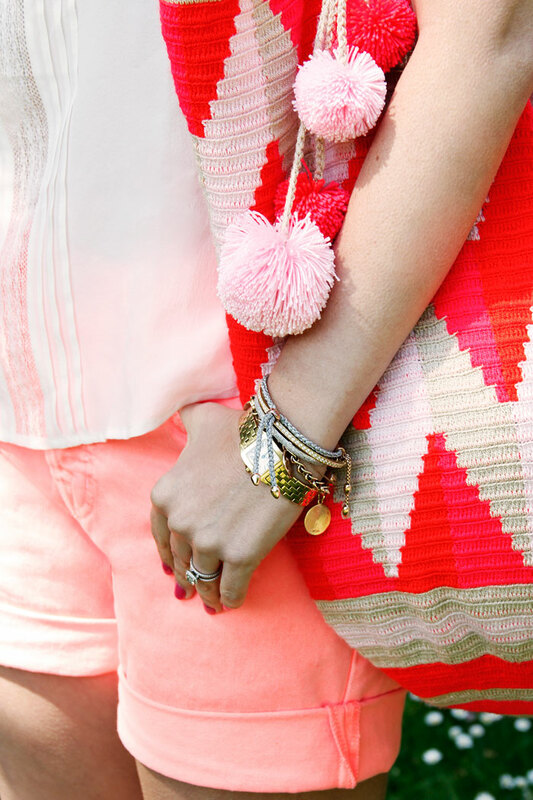 These bags are all handmade by the Wayuu people in Colombia and with their neon-bright stripes and adorable pompoms, it’s difficult to pick just one. Blouse: Des Petits Hauts. Shorts: Kennedy Boyfriend by Jbrand, available at Donna Ida or here. Espadrilles: Valentino. Bag: Sophie Anderson. Sunglasses: Thierry Lasry. Bracelets: Monica Vinader. Makeup: Scarlett Rainer. Blowout: Natalia Souza.